Week ninety and things had settled a little at home so I settled to this week’s bake with a little less stress than last week. The first bake I chose from Mary Berry’s Baking Bible was Mary’s Pecan Pie. This recipe involved making a shortcrust pastry, allow it to chill in the fridge for a while, roll it out and line a flan tin with it and line the pastry with foil, add beans and blind bake for about 20 minutes, then remove the foil and beans and then bake for another 15 minutes. 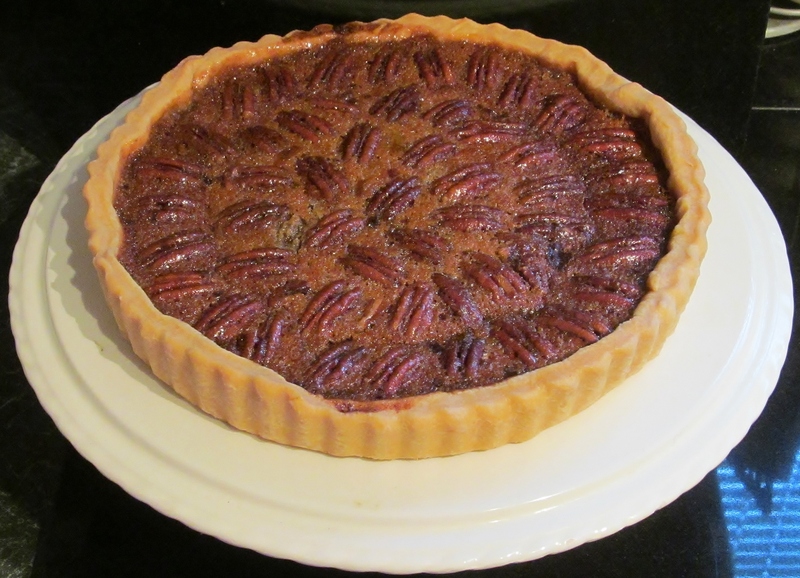 To prepare the topping, lay the pecan nuts in the pastry case and add the other topping ingredients into a saucepan and heat through until mixed, then pour into the pastry case and allow to cool and set. I thought this was a rather yummy pudding but hubby wouldn’t try it as he doesn’t like pecans…..or walnuts…..or most other nuts! 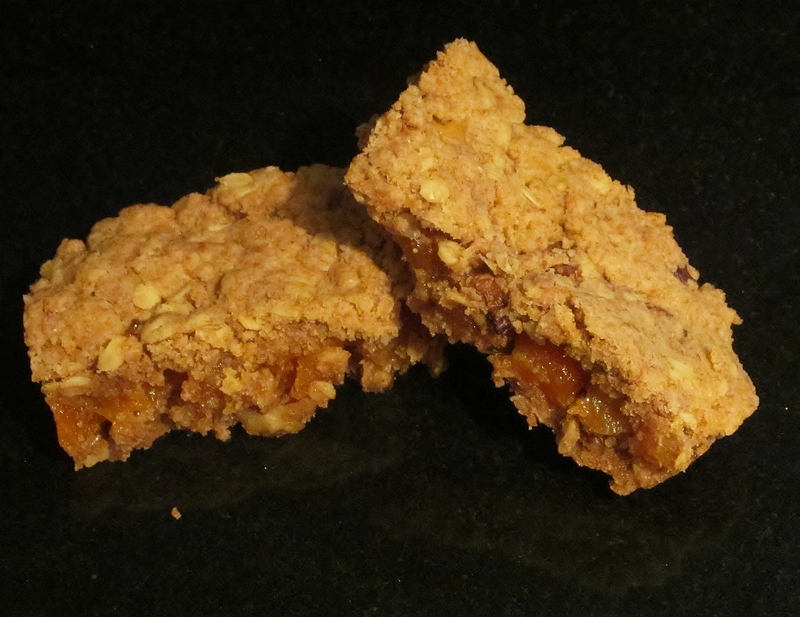 The second recipe was Mary’s walnut and apricot sandwich bars, firstly you need to cut up the apricots and boil them in some water and sugar until soft and squishy (technical baking term!) and then mix together the other ingredients, mainly, butter flour , oats and syrup. Add half the mixture to the square tin and flatten down, add the apricots and again, flatten down and finally the remainder of the mixture and flatten for the last time. Bake in the oven and when ready, cut into bar shapes while cooling. I have eaten various breakfast bars in my life and found these to be quite stodgy, I think it was adding the flour to the mix that did this. They weren’t overly popular in our house and the remainder ended up in the food recycling bin. I have been watching the Great British Bake Off with interest and now am showing interest in two or three of the contestants- I like Martha, the young girl who seems to have no fear or nerves, Like Luis the star baker of the week and I Like Nancy….lets see if one of these wins, I liked Frances from the beginning last year-and she won! This entry was posted in Kim's cake challenge and tagged Apricots, Baking Bible, Great British Bake-Off, Kim's Cake Challenge, Kim's Pecan Pie, Kim's Walnut & Apricot Sandwich Bars, Mary Berry, Mary Berry's Baking Bible, Mary Berry's Pecan Pie, Mary Berry's Walnut & Apricot Sandwich Bars, Pecan Pie, pecans, Walnut & Apricot Sandwich Bars, walnuts by kimsideas. Bookmark the permalink.